Marianne von Willemer (née Jung) was born in 1784. Like Goethe’s character Mignon she came from an uncertain background and was ‘rescued’ from a theatrical troupe by her benefactor, the Frankfurt banker J J Willemer (1760-1838). 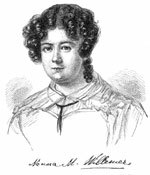 She became Willemer’s ward (she was educated in his house with his own children) and became his third wife in 1814. The couple visited Goethe in Wiesbaden when they were still engaged. Goethe was immediately attracted to Marianne and visited the Willemer house later in 1814, as well as in August and September 1815. Although they never saw each other again, poetess and poet corresponded until Goethe’s death in 1832. It was only a few years before her own death in 1860 that she revealed the true story of this extraordinarily productive literary love affair.